The national airline of the UAE also won awards for the Middle East’s Leading Airline – First Class, the Middle East’s Leading Airport Lounge for its First Class Lounge & Spa at Abu Dhabi International Airport and the Middle East’s Leading Cabin Crew. 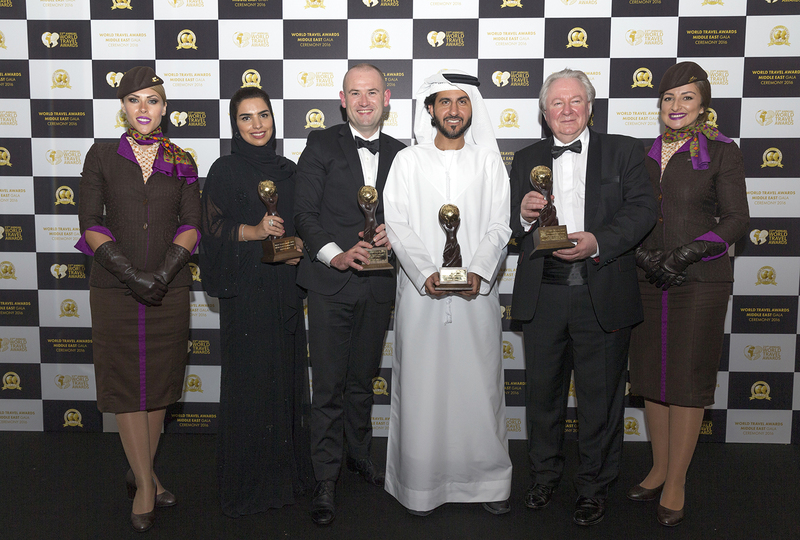 Peter Baumgartner, Chief Executive Officer, Etihad Airways, said: “These awards are about excellence in the travel and tourism industry, and since winning The Middle East’s Leading Airline award for the first time in 2006, our journey of excellence has been remarkable. Etihad Airways has grown from 22 aircraft, flying to 43 destinations and supported by 4,369 staff in 2006 – to a fleet of 123 aircraft, serving 117 destinations with nearly 27,000 multi-national staff today. The Abu Dhabi-based airline has become synonymous with the highest standards in products and service, including the best First Class offering in the world. The First Apartment aboard the Airbus 380 and the First Suite on the Boeing 787 Dreamliner are at the forefront of luxury air travel, building on the award-winning First Class experience on the A330, A340 and Boeing 777 fleet. The Residence, with its elite Butlers, is in a league of its own within the A380. The airline continues to be the world’s only full service carrier offering a three-room suite in the sky. Inspiration for the lounge comes from the finest examples of hotels, private members’ clubs and restaurants. The facility includes an à la carte restaurant, cigar lounge, Six Senses Spa, fitness room, Style & Shave barbers, nail bar and children’s play room – all to ensure guests can relax, re-energise and be immersed in entertainment ahead of their flights. While Etihad Airways boasts a modern fleet of aircraft, the airline exudes a classic elegance with its Italian-designed cabin crew uniforms. The airline’s international cabin crew are highly trained, while the warmth and friendliness they bring to the cabin environment reflect the importance of personality during recruitment. Also enhancing the experience are the Onboard Chefs, Food and Beverage Managers, Butlers and Flying Nannies. Now in its 23rd year, the World Travel Awards celebrates excellence across key sectors of the travel and tourism industry. Winners are initially selected at six regional ceremonies, including the Middle East event, before progressing to a year-end global finale. Votes are cast by travel industry executives and travel consumers.